This week's theme on SPA is Bees. I've used a image given to me by a friend. The background is partly stamped and partly doodled. 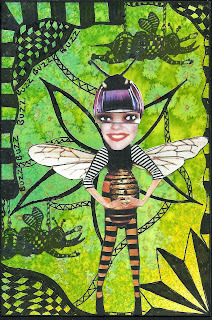 Such a friendly looking little bee your postcard is just darling Anne. Zetti bees look awesome - love it, Anne! Love the image and your superb background. Love it! The doodling adds so much and the buzz buzz buzz is a super touch! That's one happy Bee! great doodling.